Welcome to the Barnard Castle School Memorial Website. The sacrifices and devotion to country attributed to Old Barnardians in the Great War, are recorded in these webpages. Research has shown that some 739 Old Barnardians went to War, 149 of whom made the final sacrifice. 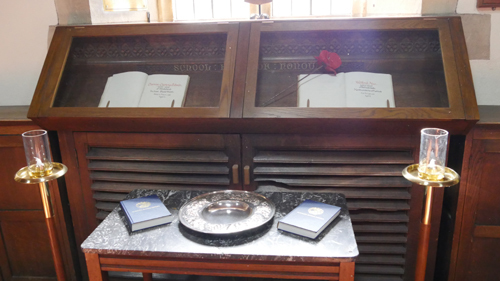 Their names can be found on the panels of the School Chapel and in the Memorial books. It is of note that Captain JG Aubin, DSO, MC and Captain AV McLare MC and Bar are just three lines apart on the Ploegsteert Memorial in Belgium. The Reverend GS Kewney and ET Champness both went down on the battle cruiser HMS Queen Mary during the Battle of Jutland. It is also recorded that four Old Boys perished on the first day of the Battle of the Somme. Lieutenant Commander George Nicholson Bradford was awarded the Victoria Cross for his valour during a raid on Zeebrugge. Thanks to Mrs Pat Burgess, Mrs Christine Hick, Miss Dot Jones and Mr Malcolm McCallum for their work on the Memorial Website. Thanks must also be offered to the OBs, who initially proposed the creation of such a contemporary memorial, and have funded its development.